In my previous blog post, I wrote about using Google+ Hangouts for faculty development and learning, particularly to connect faculty beyond our physical campus boundaries and reduce some of the redundancy in our workload. As a follow up, I'm arranging what I'm referring to as a "Teach & Share" which is simply a one-hour Google+ Hangout On Air dedicated to a hot topic in college teaching. Here is our inaugural event -- I hope you can join us! 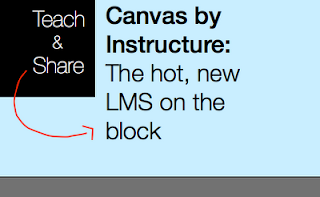 Canvas is a new, open source LMS from Instructure (http://www.instructure.com/) that has grabbed that attention of many institutions recently. 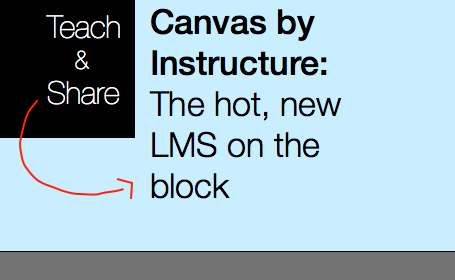 This "Teach & Share" is an open, informal invitation to faculty who are teaching with Canvas or considering adopting Canvas to share their experiences with other faculty who are beginning the process of evaluating it as a possible LMS solution. What do you like? What do you dislike? What works? What needs to improve? Bring your ideas to share and questions to discuss with your peers! What is a Teach and Share? A "Teach & Share" is simply an hour-long Hangout On Air in which faculty are invited to come together to share their teaching experiences about a particular topic and learn from one another. The event will be recorded. You must receive an invitation to the Hangout to be able to join. Have a suggestion for another Teach & Share topic? Share it here in the form of a comment! There are seats in the Hangout for up to 10 participants (including me). So please be mindful about what your preferences are to ensure those who want to contribute have a chance to get a seat. If you want to "join," be sure to follow the instructions below. If you just are interested in "view" the event, you may watch the live feed that I will embed on the Hangout page of my blog. Search for Michelle Pacansky-Brock or click here to go straight to my profile page. At the top of the page, hover over the red "Add to Circles" button and select the Circle you wish to add me to or create your own. Click here to watch a brief video that illustrates how to add a user to your Circles in Google+. Once you have added me to your Circles, I will "Add you back." When this reciprocal relationship has been established, you will receive invitations to join my Teach & Shares. On the day/time of the Hangout, open Google+ and look for the invitation that will appear in your feed. Click on "Join Hangout." If it's your first Hangout, you will need to download a plug in the first time. Have an topic in mind for a future Teach and Share? Please make your suggestion in a comment below!